UPDATE: The flow of sewage from Mexico across the U.S. border near the Naco Point of Entry has started again after it was stopped around 11 a.m. Cochise County Sheriffs say the sewage is flowing west onto private property. They say work is ongoing to mitigate the flow. The public is advised to avoid the area. Health officers say there is no immediate threat to public health and are preparing to clean up the mess. Pre-evacuation orders for residents near the flow have been canceled. 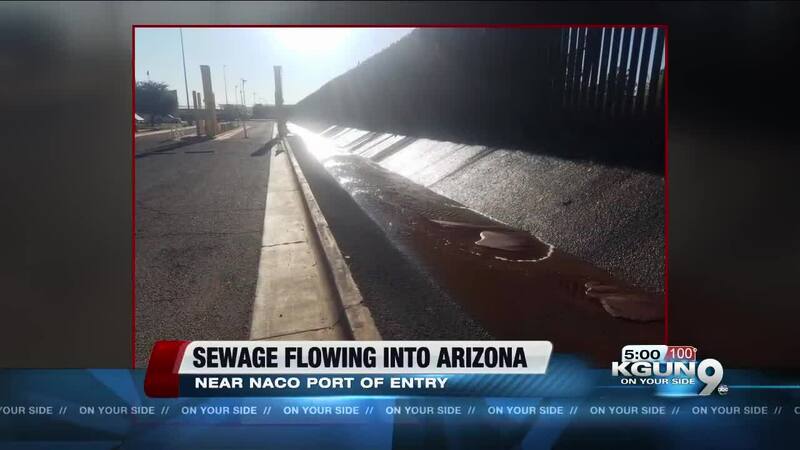 TUCSON, Ariz. - Residents who live in Naco, Arizona, near the border point of entry, are being asked by Cochise County to prepare to leave their homes Sunday morning, after a leak of raw sewage. The flow is coming from Mexico and residents will be asked by the county to leave for 24-48 hours if the flow is not stopped in the next few hours. The affected area is Naco Highway, Humphrey Drive, Friend Drive, and Domingo Street. The leak started Sunday morning and is being responded to by Cochise County environmental health, the Arizona Department of Environmental Quality, the Naco Fire Department, and Sonoran first responders. The Cochise County Sheriff's Department will assist with evacuation notices to residents in the area of concern if necessary. They urge residents to have personal items and any pet needs ready to go. CCSD says the Naco Port of Entry is open at this time, but they ask that people avoid the areas surrounding the port until further notice.